In May 2015, China released it biennial 2014 Defence White Paper titled ‘China’s Military Strategy’. It indicates that the PLA Navy would undertake a more proactive protection of its interests in ‘open waters’, which implies – albeit implicitly – the waters of the Indian Ocean. The White Paper also brings to the fore PLA Navy’s strategy for the ‘sustenance’ of the forward-deployed naval platforms in these waters through “strategic prepositioning”. What precisely does this mean? Until lately, strategic analysts worldwide were smitten by the concept of ‘String of Pearls’ propounded in 2005 by Booz Allen Hamilton – a US based think-tank. The scholarly extrapolation of China’s increasing geopolitical and strategic presence in the Indian Ocean Region (IOR) led to the prognosis that its port and maritime infrastructure projects in the IOR were precursors to China eventually establishing military bases in the region. In case of an armed conflict, such overseas military bases would be valuable for China to protect its strategic interests in the interests, particularly its crude-oil imports. These bases could provide logistics support the Chinese maritime-military forces in the region inter alia in terms of machinery and equipment spare-parts, technical services and ammunition depots, besides general replenishment of fuel, food and water. Analysts in India generally took the lead in the academic inquiry into the potential of the Chinese military bases in the IOR. Rattled by the String of Pearls ‘theory’, Beijing decried the military-strategic connotation of its financial and technical assistance to the IOR countries; and devoted much intellectual capital to prove that its intent was only economic and commercial. Among its efforts in this direction, the Chinese Academy of Social Sciences (CASS) published the June 2013 Blue Book called ‘Development Report in the Indian Ocean’. The Blue Book said that China has no maritime (-military) strategy for the Indian Ocean. The Maritime Silk Road (MSR) concept initiated by President Xi Jinping later that year in October 2013 was used to reinforce the message that China sought only economic objectives in the IOR. However, analysts and the media – particularly in India – persisted upon China’s doctrinal intent to develop military bases in the IOR, averring that the MSR was only a ‘reincarnation’ of the ‘String of Pearls’ concept. Notably, the Indians are not the only ones wary of the potential of PLA Navy’s use of the maritime facilities in the IOR. Notwithstanding the strategic convergence between Indonesia’s ‘global maritime axis’ and China’s MSR concepts, eminent Indonesian statesmen have advised Jakarta to be cautious since the maritime infrastructure being constructed through MSR could be used by China for ‘military penetration’. In July 2015, news-reports indicated that Maldives was encouraging foreign entities to own its island territories to undertake land reclamation. Coming amidst the growing anxieties caused by China’s controversial “island-building” activities in the South China Sea, this reinforced the theory of ‘Chinese military bases’ in the Indian Ocean. 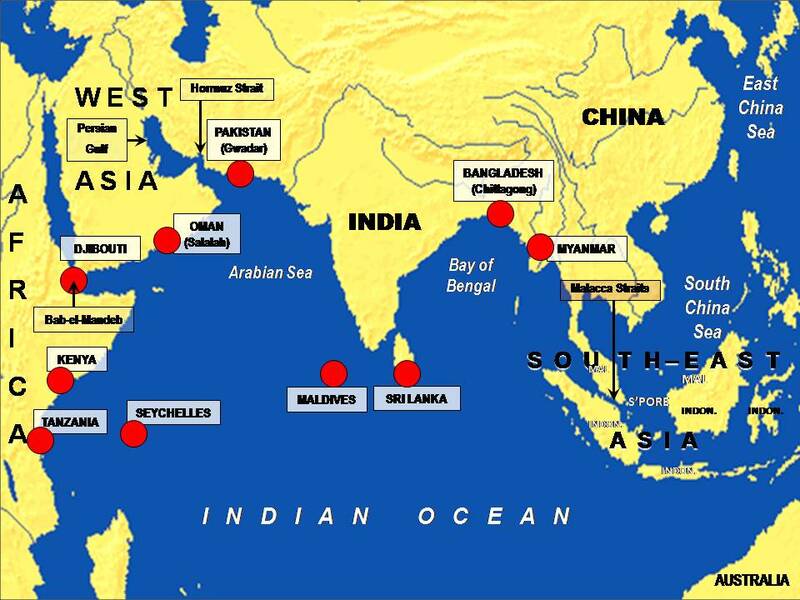 Even while Maldives is under severe strain of the long-term effects of sea-level rise caused by climate change, its government is unlikely to be ignorant of the near-term adverse geopolitical and security consequences of permitting Chinese military bases on its territory. Besides, it is most unlikely that the Chinese would need such bases anyway. Since 2011, China has been seeking a hub-and-spoke logistics support agreements with the IOR countries like Seychelles and Djibouti. Undeniably, therefore, China is seeking access facilities in the Indian Ocean, whether known by the ‘String of Pearls’ nomenclature, or fructified through the ‘MSR Concept’. Some more bilateral pacts may be added over time. However, these are not potential Chinese ‘military bases’, but agreements for peace-time replenishment of fuel, food and water for Chinese naval units, something that even India has forged with many countries, including those in the western Pacific littoral. China’s intent to sustain its naval forces in the Indian Ocean through the concept of ‘sea-basing’ has not been widely noted. The concept refers to a naval capability to undertake overseas military missions of expeditionary nature without reliance on land-based operational logistics and command and control infrastructure, either of home bases or the overseas bases. The concept was developed by the US expeditionary forces, largely due to the increasing constraints to maintain overseas military bases, besides for catering to the emerging concepts of amphibious warfare. This high probability of the PLA Navy’s resort to ‘sea-basing’ concept is supported by its July 2015 induction of the first ‘Mobile Landing Platform’ (MLP) similar to the US design. The U.S. expeditionary forces are themselves new to the MLP concept. 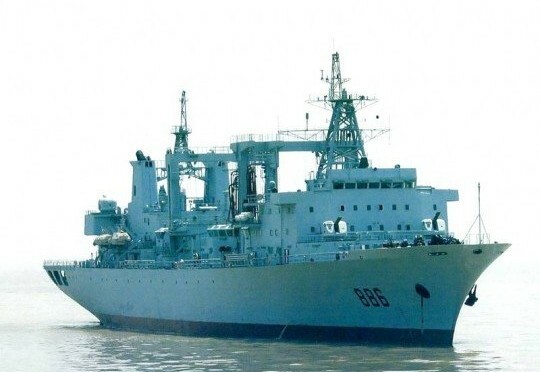 China is also known to be building naval Logistic Support Ships with roll-on, roll-off (ro-ro) design and bow and stern ramps optimised for amphibious operations. The number of the PLA Navy’s advanced underway replenishment ships is also increasing. Notably, media reports indicate that in June 2015, China launched its fifth Type 903A replenishment ship, and more are under construction. 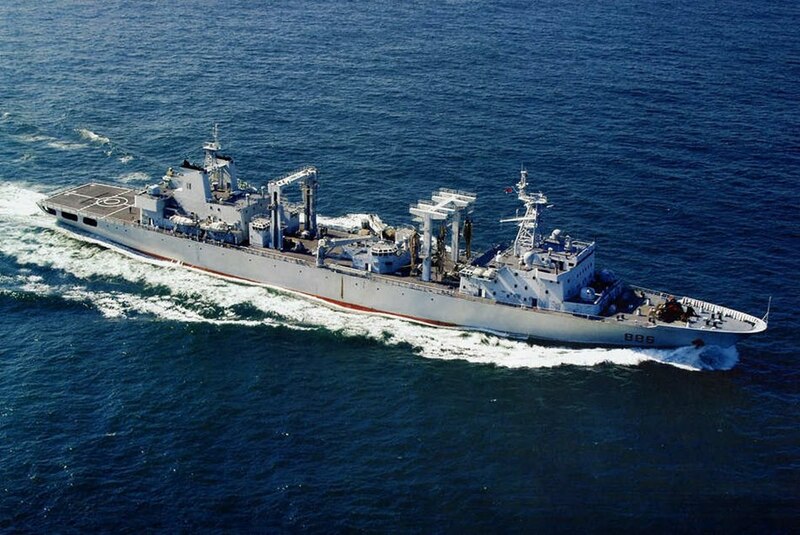 With these six new replenishment vessels added to the older fleet tankers, the PLA Navy is clearly being given the means to support distant missions in the IOR. PLA Navy’s own increasing sea-based logistics capability could be supplemented by the capacity of state-owned commercial ships, following the implementation of the new guidelines for building merchant ships to conform to naval standards. These guidelines called “Technical Standards for New Civilian Ships to Implement National Defense Requirements” were approved by the Chinese government in June 2015. The guidelines lay down not only the provisions to requisition civilian ships for naval missions, but also how future construction of Chinese merchant vessels would need to adhere to naval specifications. China is also formulating a ‘National Defense Transport Law’ to cover the additional financial costs of shipbuilding and insurance for employment for military missions. These commercial vessels are quite numerous. According to statistics from China’s Ministry of Transportation, in 2014, about 2,600 ships are capable of ocean transport, which represents a major element of asymmetry with any major navy operating in the Indian Ocean. The US Navy’s 31 Maritime Prepositioning Ships (MPS) of its Military Sealift Command (MSC) pales in comparison. The concept of ‘military base’ necessary for executing a full-fledged armed conflict may be a thing of the past. Politico-military manoeuvres in short-of-war situations are more contemporary. Therefore, in the foreseeable future, a maritime-military strategy that combines ‘peacetime replenishment’ with ‘sea-basing’ may be more than adequate for Beijing to meet its national-strategic objectives in the IOR. Captain Gurpreet S Khurana, PhD is the Executive Director, National Maritime Foundation, New Delhi. The views expressed are his own and do not reflect the official policy or position of the Indian Navy, the NMF or the Government of India. He can be reached at gurpreet.bulbul@gmail.com. Mr. Gurpreet Singh Khurana: This is an excellent article / information. How can I receive more about the same / similar subject, if you comment / write ? Thanks. As you would have noted from my article, these are very new developments that I have tried to string together to make a very tentative picture. These are early days. Things will become clearer to us as new developments emerge. Let us keep an eagle eye on these and share our analyses through CIMSEC. I encountered a Chinese Admiral at a conference in Europe some years ago and we talked of the future of the Chinese Navy. His explanation was that their long-term (presumably very long-term) aim was to develop what he termed “an international navy”. Pressed to explain the term, he replied “a navy able to operate indefinitely in any ocean without a shore base”. No doubt some hyperbole and/or wishful thinking there – the last Navy able to do that since the age of sail, was the US Navy of the 1950s and perhaps still the 1960s. But hyperbole or not, it does tie in with the core of this article. That said replenishment arrangements and/or facilities would be very useful in allowing ships to deploy and replenish before the outbreak of hostilities. And, of course, to support operations in any particular region.